This thought crystalized last night in my mind: we should to make this World Wide SketchCrawl a benefit drawing marathon for Japan! We HAVE to help our fellow artists and all our friends in Japan! They need our help. We have raised money for a good cause before with SketchCrawl and it’s time to do it again. It’s time to come together and draw with a real meaningful and important reason! With hundreds of SketchCrawlers around the globe we could end up with a significant donation and on top of that we’ll let our Japanese friends, brothers and sisters know how much they are in our minds and our hearts. This post has been updated with links to the fundraiser logo and sponsor’s form. Thank you for your help! 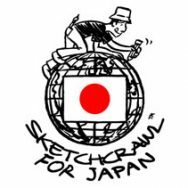 We’re planning to sketchcrawl on the 16th for Japan, too. Question: should we send the funds we raise to you or directly to GIVE2ASIA? If we send directly to G2A, how will Sketchcrawl get “credit” for our donation? Please send the funds directly to GIVE2ASIA SketchCrawl fund. I’m the president of the Berkeley After Hours Animation student group at Berkeley City College. Would it be okay if a few of our members joined Saturday’s SketchCrawl with you? However, we are all students in the animation department at BCC and would love to participate! Sketchcrawl events are open to anyone from all skill levels. First: I am an advanced senior cit, and don’t get around much any-more. But, I have done self study of art drawing, painting and artcrafts. And now am ready to do some picture painting, since I have also a pack of sketches from down through the years. I had no finances to go to art school. That is why my interest in everybody’s art. I love it !! Thank you for sharing Pauline, indeed… lack of resources should not stop anyone from learning, where there is a will, there is a way!